WAIST HIGH: Cause The OLCC Says So. That's Why. Cause The OLCC Says So. That's Why. (katu.com) PORTLAND, Ore. - Liquor giant Diageo is asking the Oregon Court of Appeals to overturn a ban on drinks called malternatives. Oregon's Liquor Commission voted to ban the malt-flavoured beverages from grocery stores starting the first of the year. 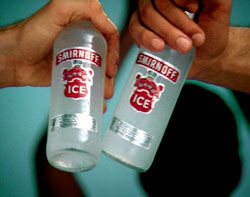 Diageo makes Smirnoff Ice, Oregon's top selling malternative. The liquor giant argues the liquor commission failed to follow proper procedure when it enacted the ban, because it did not allow any public comment. Banning the beverages from supermarkets and convenience stores means the drinks will have to be sold in liquor stores, where they will be taxed at a higher rate and will be less accessible to buyers. According to Oregon law, the malternatives contain too much liquor to be sold in supermarkets.